Heretic is by the late, imported Trakehner stallion Kantor II. Kantor was approved at Neumuenster in 1980 and completed his performance test at Klosterhof Medingen in 1981 where he finished 27th out of 63. He stood at stud in Belgium, Germany and the Unites States and has sired numerous competitive offspring. Most notable is his daughter Adrianne *Ps* (shown as Adel Adrianne) who competed successfully at Grand Prix in the United States. Heretic's dam is by the successful and much sought after stallion Habicht. Habicht had his own eventing career and is sire to numerous top-level competitors both here and in Germany. Among the most well-known is the Olympic Bronze Medal Eventing stallion Windfall *Pg*. Though a knee injury prevented Heretic from a competitive career, she is a wonderful broodmare with strong bloodlines and nice movement. She moves with a lot of articulation of her joints and suspension. 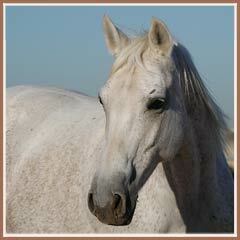 She is an excellent cross with modern type stallions. 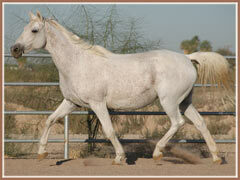 In May 2009, she foaled a typey and athletic filly by the ATA-approved Trakehner stallion Apollo Sun. Honora has her dam's typey good looks with a winning combination her parents' movement. Heretic stands 15.3 and is a pleasure to work with. She is a good mother and very patient with her offspring. Video of Heretic can be found on YouTube HERE! This footage is from March 2008 when Heretic arrived here at Sovereign Farm.